Quick Post: Coho salmon was on sale at Publix so I had to pick some up. Wild salmon is a healthy treat for us – all except my daughter – she has an aversion to fish (she’s my picky eater). 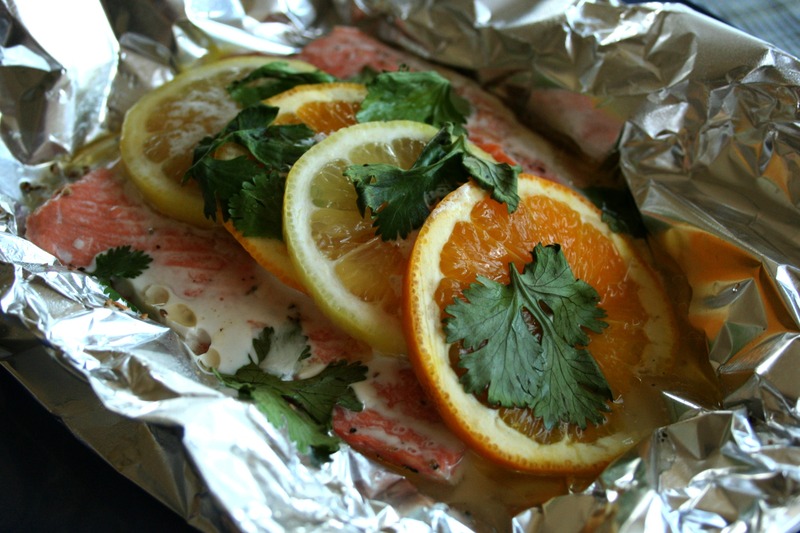 I baked the salmon in foil again – it is a fool proof method. Maybe one day I’ll try something new, but when it comes to using an expensive food like this, I go with what I am most comfortable with. This time I used orange and lemon slices to season my fish along with some cilantro that I had leftover from making this to give it an herby kick. We enjoyed this with this garlic rice pilaf and a green salad. Thanks for reading, enjoy! 1. Preheat oven to 375 degrees. Ready a piece of foil on a baking sheet. 2. Place the salmon on the foil, season with salt and pepper and lay the citrus slices across the top of the fish. Place dots of butter on top and lay the cilantro leaves over all. Gather the sides of the foil to create a package – don’t seal too tightly or you may tear the foil. Place on top of a baking sheet and bake for 15 minutes (depending on the size and thickness). Great photo and a really great recipe. Salmon is ALWAYS best done simply.